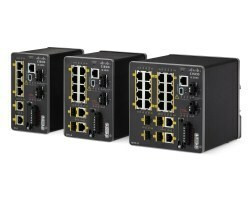 Cisco unveiled the Industrial Ethernet (IE) 2000 switch series, a cornerstone product for the company’s Connected Industries business unit and industrial network offerings. The IE 2000 series is an extension of Cisco’s current industrial Ethernet product lines, the Catalyst 2955 and the IE 3000 series. They are all fixed configuration devices for Layer 2 switching and Cisco IOS-based software features and services. The three switches support 4-, 8- and 16-port configurations of 10/100Base-T Ethernet. They also support two optional 100BASE-T or 1000BASE-T uplinks with SFP or RJ45 connectors. They feature a forwarding rate of up to 6.5Mpps with 64 byte packets; 8,000 unicast MAC addresses; 255 IGMP multicast groups; and 255 VLANs. They support IEEE 802.1x for identity-based network authorization; encryption through SSH; DHCP snooping to thwart unauthorized message interception; prevention of faulty end devices from compromising overall system performance; and industry-specific standards such as IEEE 1588, CIP and PROFINET for integration with other industrial Ethernet devices. The IE 2000 switches are designed to provide consistent network services between industrial environments and enterprise business applications, and also enhanced security and manageability. The switches also provide secure remote access and monitoring of automated systems, and energy management with visibility into machine performance, Cisco says. The new switches can also deliver video and other corporate applications to manufacturing plant floor, Cisco says. Targeting a Niche Market—Cisco’s timing seems right to forge ahead with new products. By 2016, there will be nearly 2 billion machine-to-machine wireless connections — including GPS systems in cars and asset tracking systems in shipping and manufacturing sectors — demonstrating the need to more tightly connect and integrate devices, machines and vehicles with traditional enterprise networks, according to Cisco’s Visual Networking Index. The Cisco IE 2000 industrial switch portfolio was officially unveiled at the Hanover Messe Industrial Automation trade fair in Germany this week. Cisco will also be displaying its complete line of industrial networking solutions from its Connected Industries business unit, including the Cisco switching solutions developed in collaboration with Rockwell Automation, showcasing switching solutions that enable faster deployment and reduced risk for manufacturing, oil and gas, mining, transportation and energy companies.